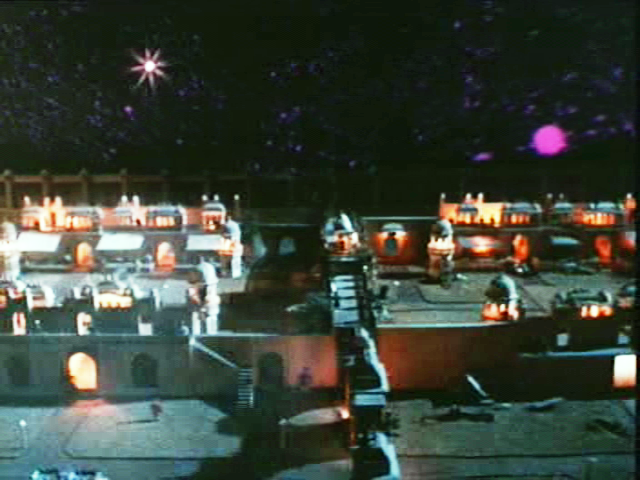 What better way to start some Christmas entertainment than with a mysterious star in the East? Surely this outfit just screams ‘Christmas Bauble’ (or according to Beth, ‘Mughal beach ball’). 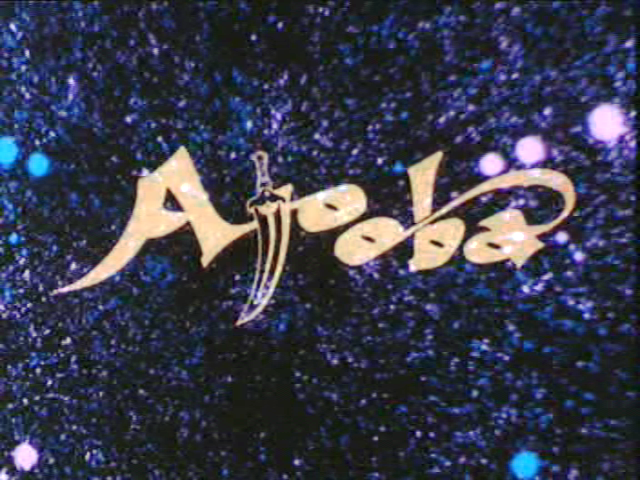 Ajooba is a masala film masquerading as a magical sword and sandal romp. 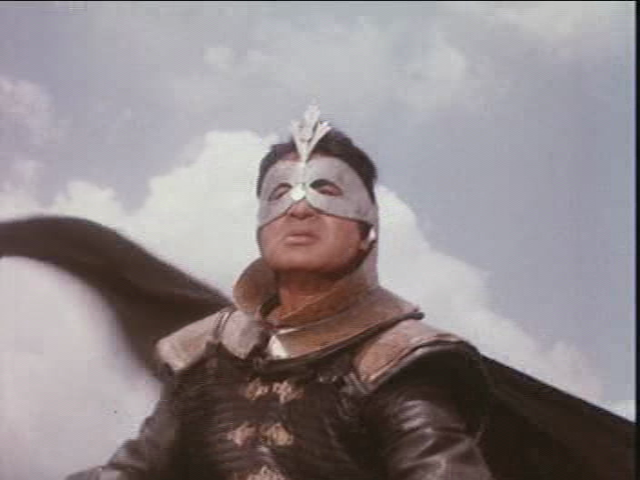 It is replete with a masked hero, a devil worshipping usurper, a good magician and his feisty daughter, sea monsters and so much more, made with enthusiasm rather than skill. While it may not be the story of Christmas, it is a miracle that Amitabh Bachchan and Rishi Kapoor agreed to grace this film by Shashi Kapoor. I think it shows how much they loved him. 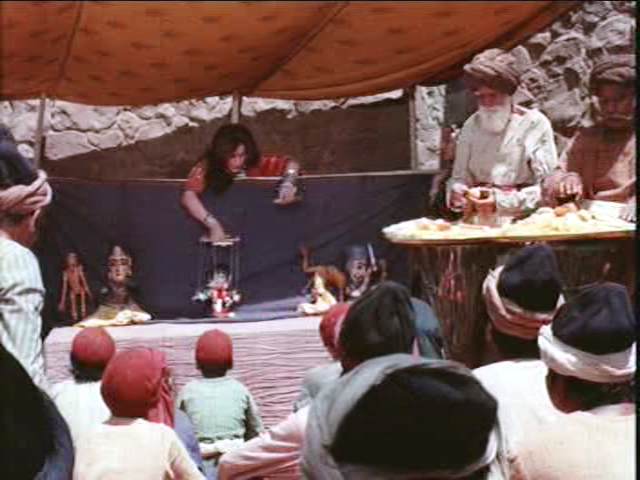 Ajooba was quite a venture; expensive and a Russian co-production, so it seems like something Shashi felt strongly about making. Once upon a time in Baharistan, the Sultan (Shammi Kapoor) and his wife (Ariadna Shengelaya) had everything they could want … except a son. Finally, after some magical intervention to protect the unborn child, an heir was born. Hurrah! The people rejoiced with a fun Laxmikant-Pyarelal number. There’s lots of colour and movement including a display of dazzling (ahem) magic, and a dance-off between a kind of skanky snakey dance and some Kathak-ish guys. 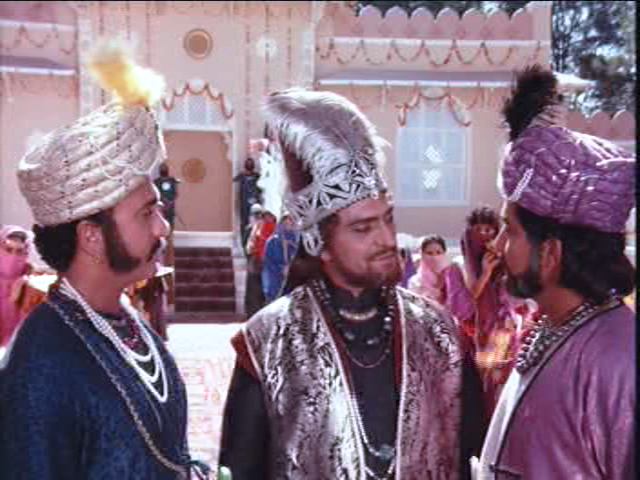 Amir Khan (Saeed Jaffrey) is a good magician. I use ‘good’ in the sense of not using his powers for evil, not as an endorsement of his skills. 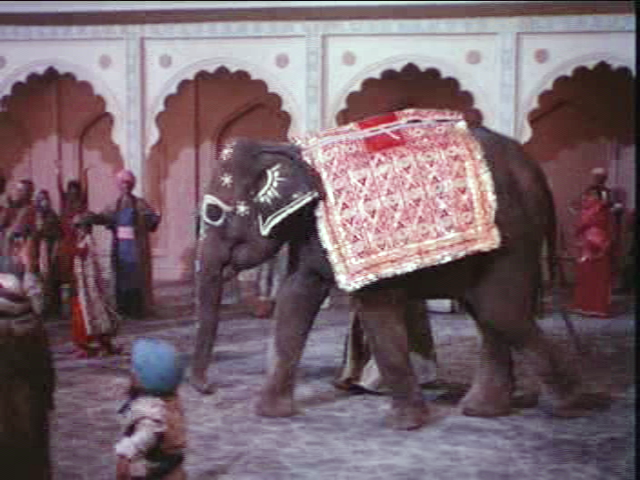 The most impressive thing about his elephant trick is that the elephant looks like it is wearing dark glasses (perhaps it knew this film was not a great career move and was in disguise). 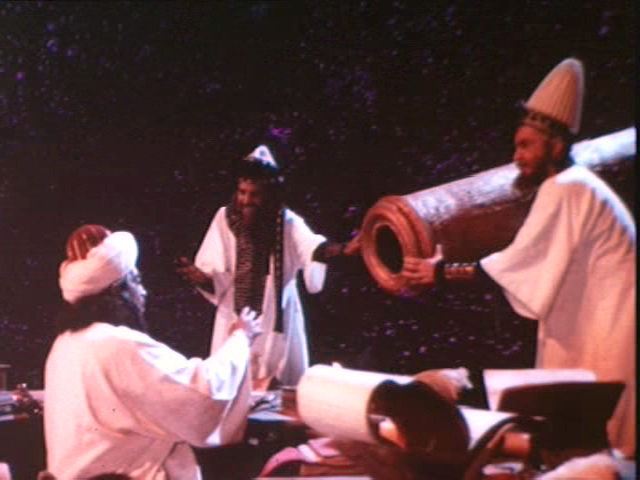 The evil Vizier (Amrish Puri) attacks the toy boat of the Sultan and Malika. The royal family is scattered, each believing they are alone in the world. Malika is blind, the Sultan loses his memory, and their baby is presumed drowned. 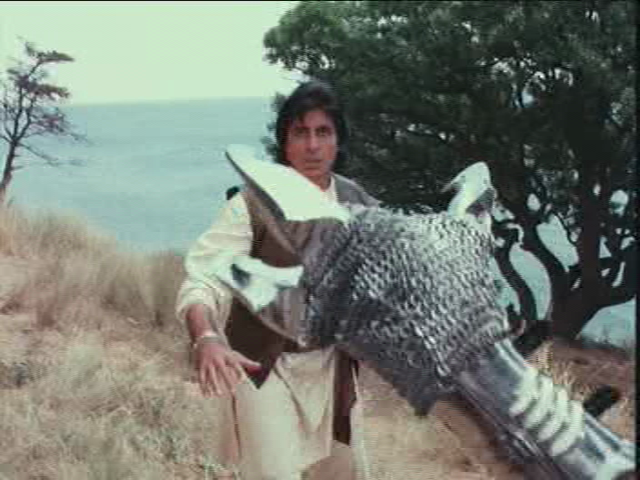 Rescued by a dolphin, raised by a kindly blacksmith, unaware of his real parentage, Ali (Amitabh Bachchan) undergoes years and years and years of training to become the hero who can free his people. Well, those people who are still left after 30 odd years of brutal oppression. 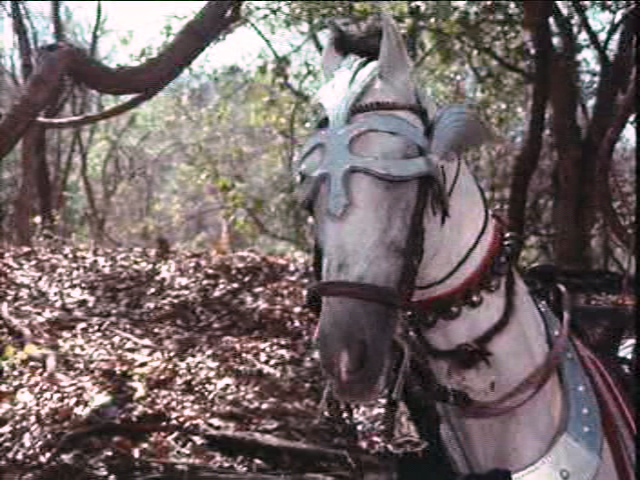 Maybe it was the costume that held him up, especially creating a cunning disguise for both Ajooba and horse. Why something as silly as a tin mask will be so detailed and finished with little flourishes when so much else is left half-baked is part of the charm. It doesn’t save the idea from being daft, but it is fun to look at. There is a serious design flaw. Did you spot it? 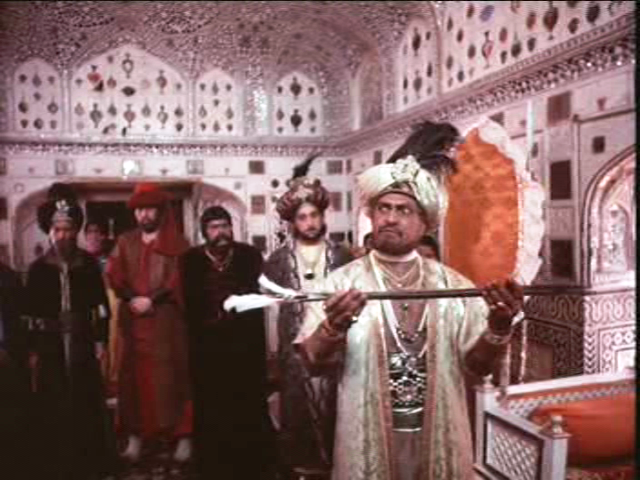 With the Vizier in power, life is tough for the simple folk of Baharistan. They still have their picturesque outfits but Amrish Puri and his brother-in-law Shah Rukh (Dalip Tahil) pillage and plunder as the mood seizes them. With all of his evil deeds to draw on I expected the Vizier to have better material for his catch phrase, but he sticks to ‘Shaitan Zindabad!’. It is clear that he is bad and so are all his associates. 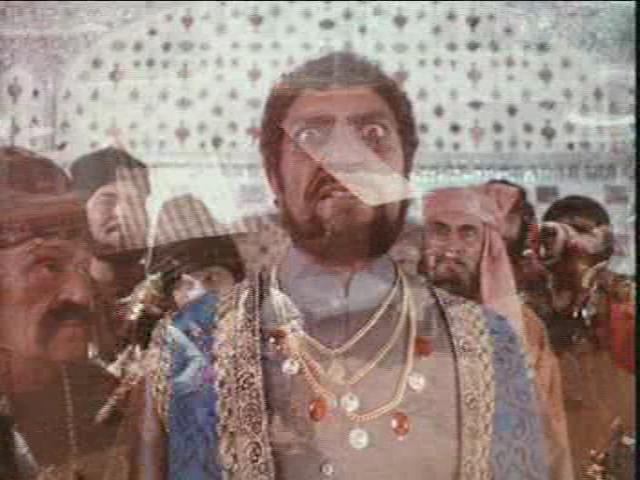 The evil shtick gets a little monotonous despite Amrish Puri’s eyeballs giving it their all. When Amir Khan is imprisoned, he sends messages back to his family in Hind by talking to birds. Luckily his daughter Rukhsana (Dimple Kapadia) can communicate with animals so she sets off on a rescue mission, leaving her mother (Sushma Seth) behind. Rukhsana works as a puppeteer in the bazaar and I liked that she had a plan to both support herself and give a cover story as she was searching for her dad. Baharistan is not the place for a single lady, and it doesn’t take long before she needs rescuing. Repeated rescuing. 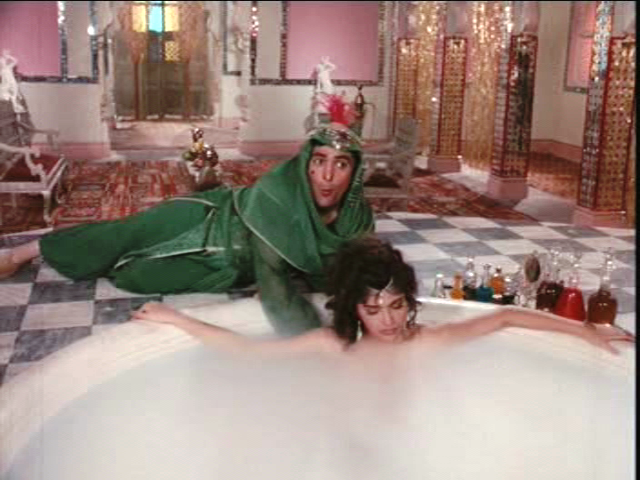 Ajooba becomes somewhat tired of this damsel in distress, but she sees through his flimsy disguise (amazing!) and of course that means true love. 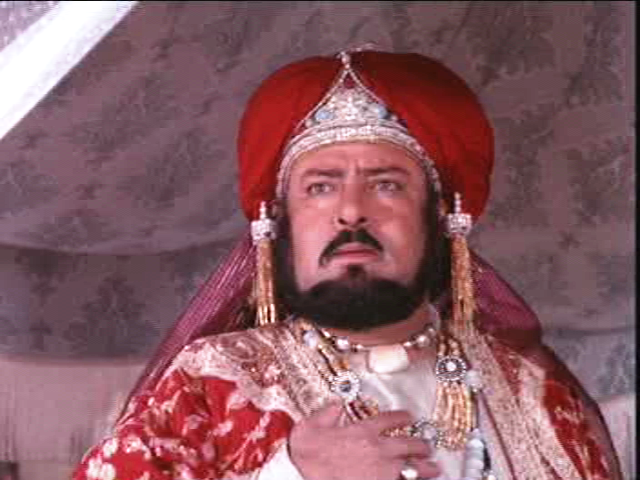 Rishi Kapoor is Hassan, the local Romeo who falls for the Princess Henna (Sonam). That’s about as much character development as you get. I liked Rishi and Amitabh together, and they have a fun song as the romantic Hassan tries to get repressed Ali to talk about love. The romances play out as you would expect, and Dimple and Amitabh make the more interesting couple (though that is not saying much). Ali does wrestle a tiger to rescue Rukhsana and Amir Khan from the dungeons so that added a level of commitment. Of course in a fairytale there are trials and tribulations before good can triumph and that means special effects! If only someone had told Shashi Kapoor. 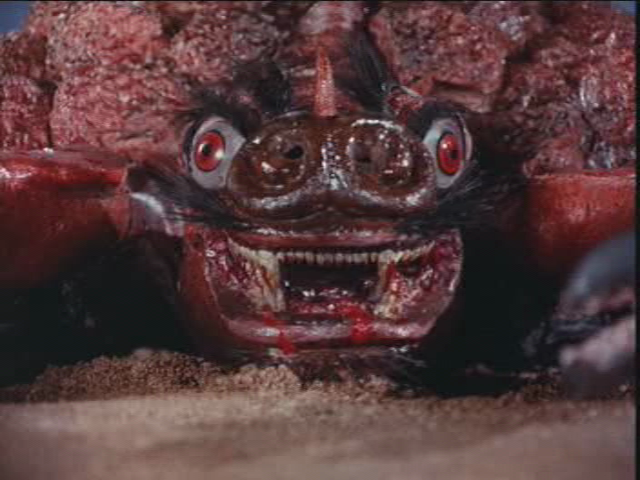 The visual effects are quite poor and while it is part of the cheesy fun, I do wish they had done a little better. Beth did ask why a flying gondola was employed in one scene and I think it is because the maximum passenger load for a flying carpet would have been exceeded. And there are some odd lapses and inconsistencies. When Ali’s sister needs to give him an urgent message, she wends her way through dim corridors and finally a concealed passage which opens into Ali’s secret training ground. It’s an open field next door that anyone could see. And when Ali and Hassan are chained up with Malika and the blacksmith awaiting Certain Death they are rescued by a sea monster…or are they? Four people in chains, three sets of chains are cut. What about your foster dad Ali???? I recognised so many faces in the background. Memsaab as usual provides a more rigorous acknowledgement of the supporting artists so you should go read her post. But just think – Dara Singh, Sushma Seth, Rajendranath, Narendranath, Tej Sapru, Bob Christo just to name a few! The locations and sets are delightful, and enhance the fantasy and poetic flavour. The art direction is batty at times, but this is a pleasure to watch. The streets of Baharistan are always full of colourful locals ready for a backflip or bellydance. 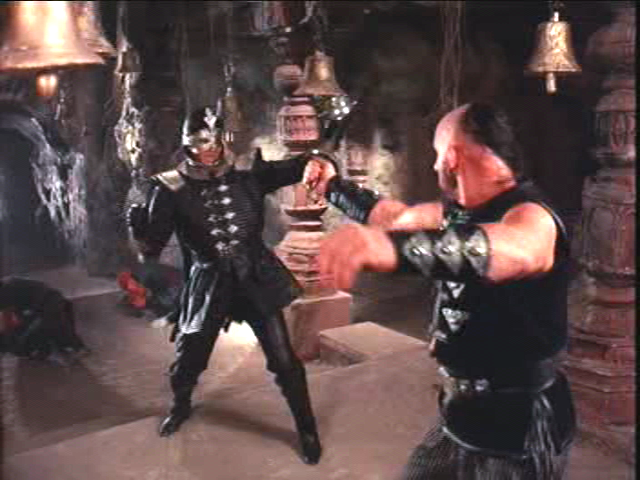 The fight scenes are OK without being amazing, flying carpets or no. 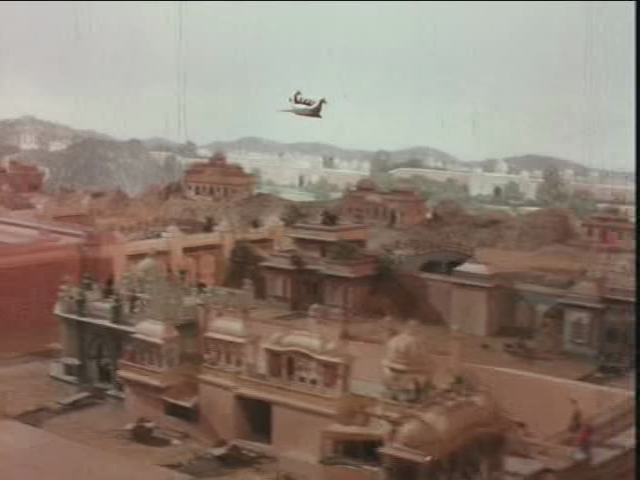 But there is a brilliant episode in a temple with Amitabh swinging from bell to bell to dishoom Bob Christo and rescue Shammi – it is epic and silly and I love it. The final battle gets everyone to Baharistan and there are reunions and expositions all over the place. 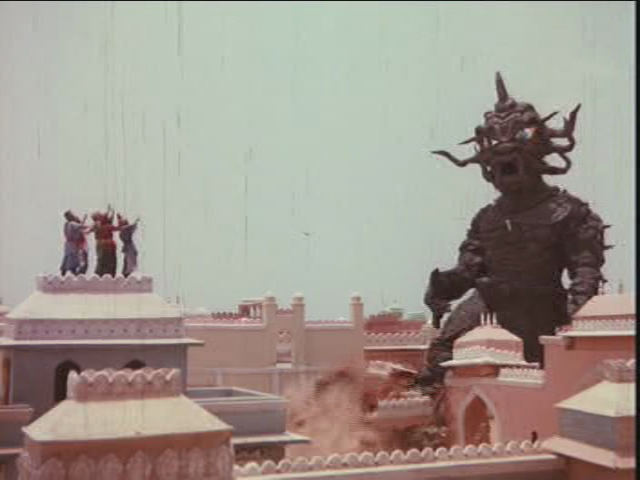 I absolutely love that in the climax fight, once people realise Ajooba is Ali is the long lost prince, everything pauses briefly so the onlookers can have a chat amongst themselves about how he is related to everyone and what his title is. Never mind the big glowing sword, or the evil sorcerer – is he your cousin? And is he married? 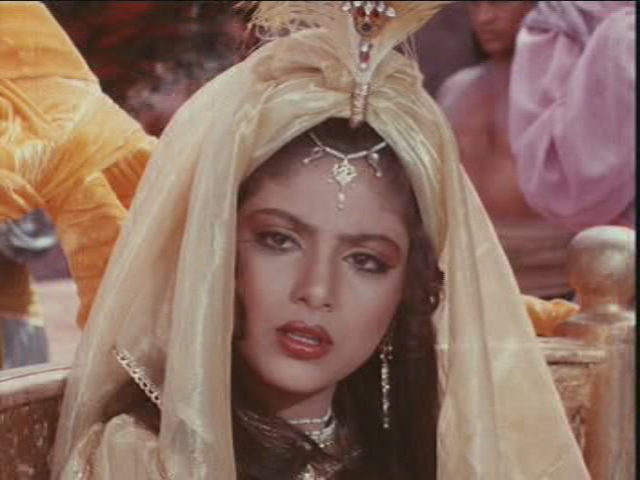 Ajooba’s heart is pure masala gold and I have enormous affection for it. 4 stars for entertainment alone! This entry was posted in Bollywood and tagged Ajooba, Amitabh Bachchan, Amrish Puri, Ariadna Shengelaya, Bob Christo, Bollywood, Dalip Tahil, Dimple Kapadia, Hindi, Laxmikant-Pyarelal, Rishi Kapoor, Saeed Jaffrey, Shammi Kapoor, Shashi Kapoor, Sonam. Bookmark the permalink. DITTO! And Temple, you are a mad genius to have made the Christmas connection! Just shows Shashi picked up on some western traditions in all his Kendal-relating years, I guess. Beth – you inspired me to watch this in the first place. I remember having to argue with the DVD shop guy about why I wanted it before he would give me a copy. 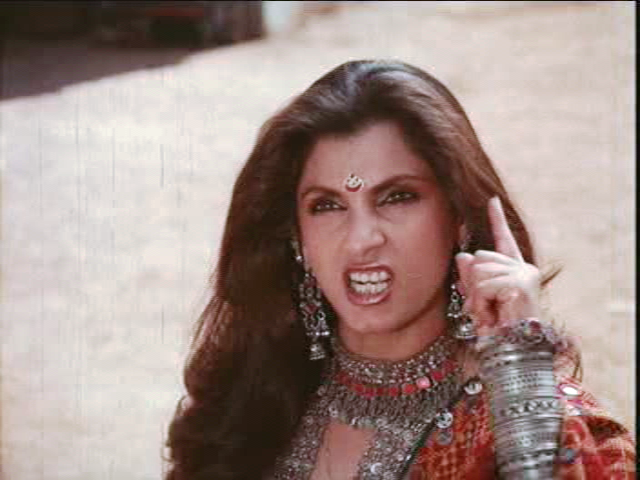 Memsaab – I love Ajooba, I really do. But I can’t honestly recommend it as a good film without a lot of qualification so … SBIG. Maybe I need a new category. ‘So not-quite-right it’s awesome’? Yay! Happy to see you review this film as I was just browsing (painfully) through it yesterday in preparation for my coproductions post. What I can’t figure out is where is the “Russian” half of the production! Are the white chicks in that one screencap Russian? Was there like one timid editor who was from Russia? It seems to me that most of the Indian-Soviet coproductions look indistinguishable from any other masala Hindi film, which is interesting… Anywho I do see that in the song you posted there is some Kathakishy dancing but I can’t bring myself to post it! 🙂 I love your elephant comment: “perhaps it knew this film was not a great career move and was in disguise” haha! By the way, the DVD makers must have stolen that back-cover review from IMDB, third-one down: http://www.imdb.com/title/tt0101283/reviews Clearly they didn’t read it before slapping it on there. That’s what they get for plagiarizing. 😀 Anyway, amusing review! 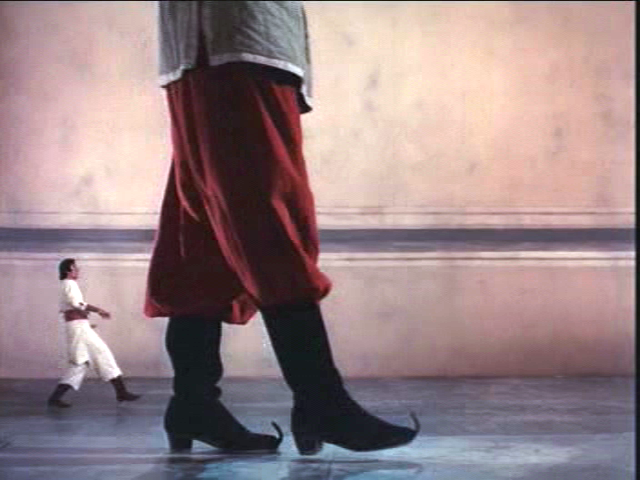 Oh I never find it painful to browse through Ajooba 🙂 The Kathak-ish guys appeared as a result of magic so I enjoyed the idea that of all the wonders Amir Khan could have produced, he picked those blokes.